Located just 10 minutes from the Bozeman Yellowstone International Airport and walking distance to the East Gallatin River. We have 2 antique sheepherder wagons available to rent and a sheepherd's cabin. 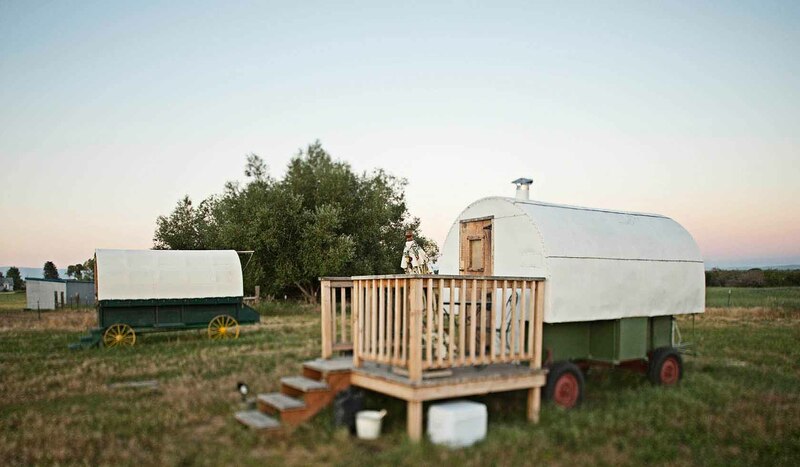 One wagon is a "hard top", the second is a canvas top and we offer nightly or weekly stays. In addition we have tent camping space. The wagons and cabin each sleep two. There is some space on the floor for a sleeping bag as well. Be sure to ask about the discount if you rent both wagons. We have a heat-on-demand shower house with lots of water pressure and in keeping with our sustainable nature, we have also converted an outhouse with a composting toilet. We get a lot of positive comments on both! A 3-burner stove with optional grill is situated adjacent to the porch on the wagon for your convenience. All cooking utensils are provided. You may also choose to build a fire in the fire pit.